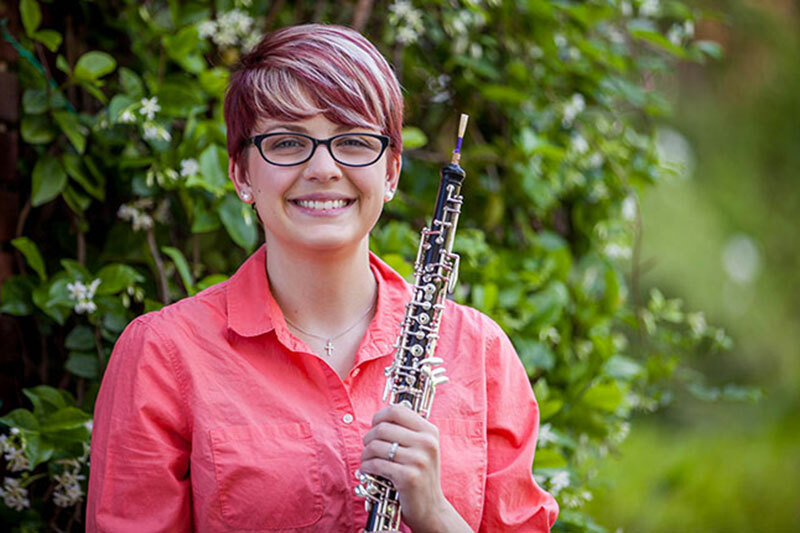 After completing her degree in music education, she has accepted an opportunity to play oboe in the highly selective U.S. Army Band. Erica isn't afraid to take on a new opportunity, a skill she gained at Meredith. “Meredith offered me countless opportunities to try something new and step out of my comfort zone. Sometimes I discovered a new idea or a new passion. Other times, I gained a humorous memory. Because I learned how to risk failure, I have become a strong student, teacher, and musician." Erica has benefitted from her support system at Meredith. While at Meredith she was a member of nearly every campus musical ensemble, performing with the Meredith Flute Ensemble, Opera Workshop, Encore!, Meredith Chorale, and the Meredith Sinfonietta. She also played in the orchestra for Meredith Ensemble Theatre and White Iris Light Opera performances. Another opportunity was student teaching at Heritage High School, an experience that she treasures. A Talent Scholarship recipient, she also helped plan Meredith’s Scholars Weekend activities for prospective music majors, and is a member of Sigma Alpha Iota, an international honors society for women musicians.